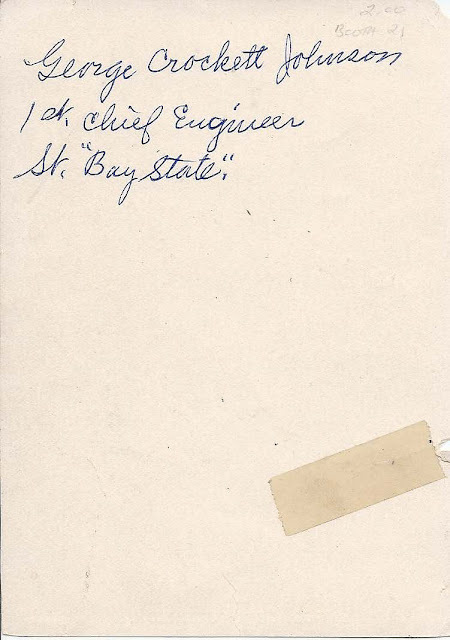 Heirlooms Reunited: Photograph of George Crockett Johnson, 1st Chief Engineer of the Steamer "Bay State"
Photograph of George Crockett Johnson, 1st Chief Engineer of the Steamer "Bay State"
Photograph of George C. Johnson clipped from an unknown publication. He's identified on the otherwise blank reverse in handwriting as "George Crockett Johnson, 1st Chief Engineer, St. "Bay State". The Steamer "Bay State" ran between Portland, Maine, and Boston, Massachusetts and was wrecked on 23 September 1916 on the rocks of High Head, Cape Elizabeth, Maine, in heavy fog as it neared Portland, Maine; thankfully all aboard were rescued. George Crockett Johnson had passed away by that time, in 1912, or I imagine it would have been a terrible shock for him. See images of the "Bay State", before and after the grounding, at the Maine Memory Network. 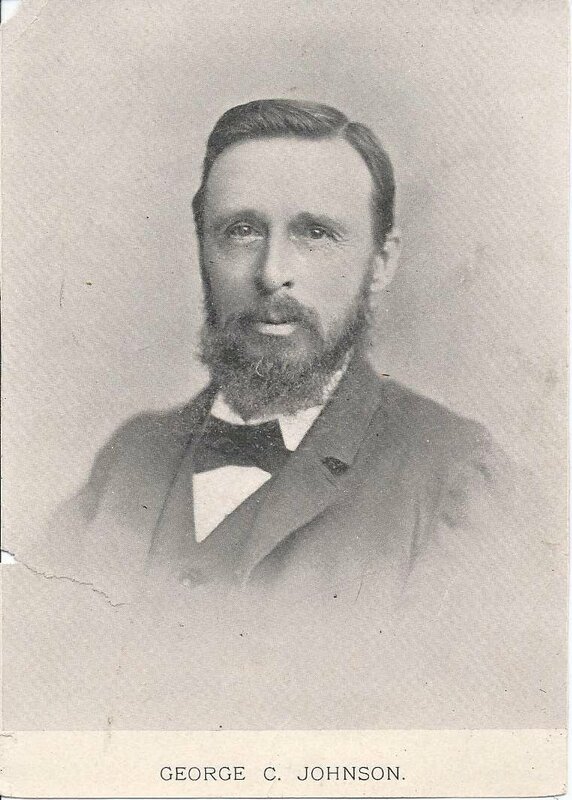 George Crocket Johnson was born 17 November 1832, at Portland, Maine, the son of Capt. Ebenezer, Jr., and Ann (possibly Mulloy or Malloy or Mallory] Johnson. Ebenezer Johnson, also a well known mariner, was born at Falmouth, Maine, about 1798. Mary J. Rich, daughter of John and Mary Rich, whom George married about 1854. Mary died about 1856, leaving a son Charles Edwin Johnson, who died at age six. Helen P. Gibbs, born 20 May 1852 at Greenwich, Massachusetts, daughter of George H. and Philena (Phinney) Gibbs. Helen and George had four children, I believe, two of whom survived to adulthood. Helen died in 1908. George Crockett Johnson died 30 May 1912 at Portland, Maine. 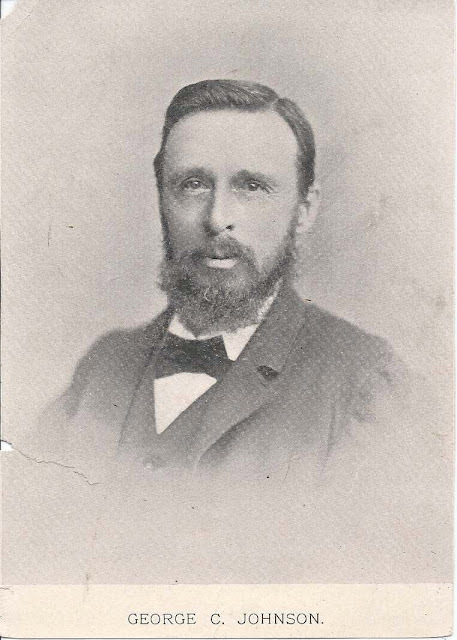 For more information on the seafaring careers of George and his father Ebenezer Johnson, click here to read a biography of George Crockett Johnson published in George's lifetime in 1896 in the Biographical Review for Cumberland County, Maine. If you have corrections and/or additions to the information above, please leave a comment or contact me directly. I'd especially like to know more about George's mother Ann.